RGIII moves into the number one spot on the year with his nearly 70% completion percentage, 8.6 Yards per attempt, and only one interception so far. Brady, Ryan, Schaub, and Newton round out the top 5. The bottom five are Fitzpatrick, Sanchez, Weeden, Wilson, and,in dead last, Gabbert. Fitzpatrick is being way over-rated by passer rating because he leads the league in passing touchdowns at 12. His QB rating is being artificially inflated because he was lucky enough to have his offensive coordinator call passing plays near the end zone. RIPPEN ignores this. On the other send of the spectrum, a guy like Cam Newton is being under-valued by QB rating. Sure, he’s thrown 5 interceptions so far this year, but he is also averaging 9.5 yards per attempt, which leads the league. He’s 0.7 yards per attempt better than the second QB, Andy Dalton, who is at 8.8 yards per attempt. 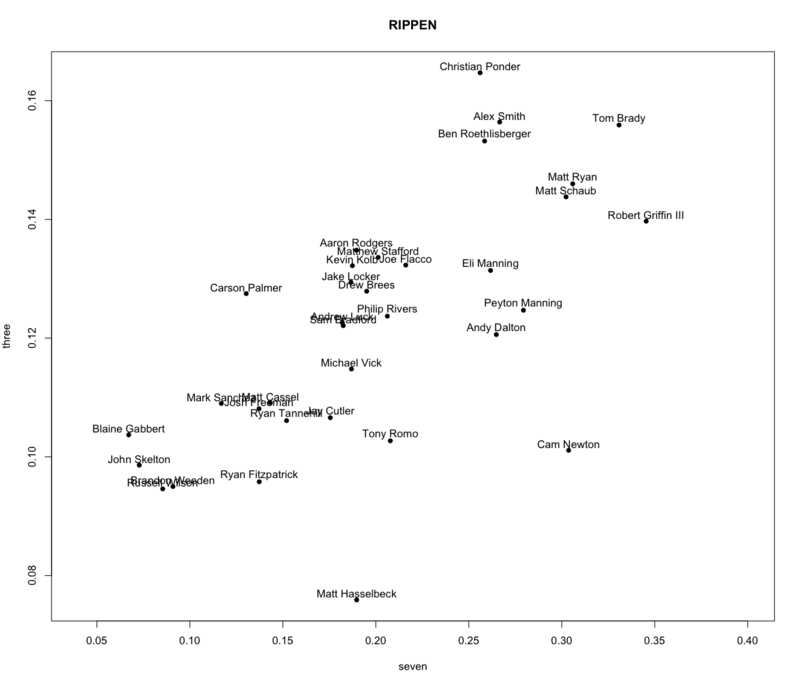 So feel free to go on using QB rating and thinking Ryan Fitzpatrick is an average quarterback, but, if you prefer, you can catch a slightly better glimpse of reality by using RIPPEN. Posted on October 2, 2012, in Football, NFL, Sports. Bookmark the permalink. Leave a comment.